What has been missing from the Grubgang site is reviews of Indian restaurants. This is mainly chief reviewer Clairs fault (apologies Grub gang fans!) as she unfortunately doesnt like spicy food, making the other Grub gang members lives a bit difficult choosing venues sometimes!! 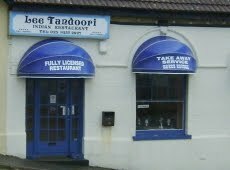 Luckily, Gemma dosent give up easily and took us all to Lee Tandoori along the seafront in Lee On The Solent. The popadoms were lovely and went down even better with the accompliment dips! The naan bread were a little oily and like popadoms in texture, not light and fluffy as you would expect in an Indian restaurant. The main meals also went down well, the currys being very tasty as mentioned by the spice lovers in the group. Clair was impressed with the chicken noodles and chips, which were not spicy in the slightest and was satisfied she had had a tasty meal. The staff were very helpful and had noted that the soup had not gone down well with Clair, offering to find her an alternative if she wished and were also quite jovial with the group, making us feel at ease. No desserts were on the menu, so the bill came easily within the £20 limit and worth every penny. The gang were very impressed with this Spicy retreat. Thankyou Gemma for your choice!